리마, 페루의 카미누 룸스 바랑코 | 호스텔월드에서 예약하세요. 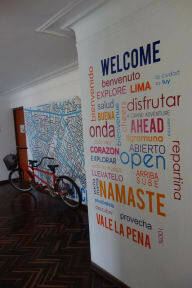 Kaminu Rooms Barranco is friendly and welcoming and you will find comfort and a good atmosphere. We offer you cosy shared rooms where all beds have comfortable mattresses, which support your health and a good rest. We also have ample lockers where you can store your things safely. You can enjoy the smell of the sea and watch the sundown while sunbathing on our charming and spacious terrace with table football, board games, a fully equipped kitchen and a clay oven. We are located in one of the best locations of the city, near to some of the best attractions and landmarks of the city such as Museo de la Nación, Estadio Nacional de Peru and the beach amongst other interesting and fascinating places that you can visit and discover in our city. We have different private accommodation options with several capacities and all the necessary services to bring a great stay to our guests and travellers within our facilities. 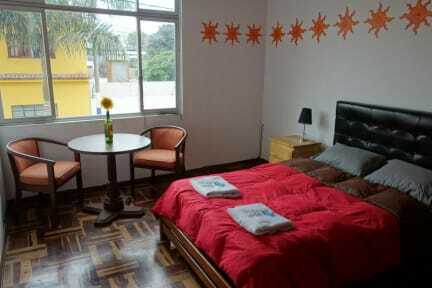 The hostel has a living room with cable TV, DVD, Blurray, free internet service with WIFI and cooking facilities so you can prepare your own meals should you wish. We also have a filter to purify the water so you don´t have to purchase it or generate plastic trash, saving money and reducing pollution. Bajada de baños 342 - Barranco, Lima. Payment upon arrival by cash, Visa cards.